On a trip to Washington, D.C. we visited Arlington, VA and paid a visit to Tupelo Honey Cafe. Now we have dined at a Tupelo Honey in Georgia before, but it was on a Sunday before noon, so we weren’t able to imbibe. Anyway, we had heard that this location’s Queen Mary Bloody Mary featured a “golden” bloody mary mix, so we headed there expecting a yellow-hued drink. We were sorely disappointed to receive a normal, red-vined beverage. The menu even noted “golden” but when we questioned our bartender he looked at us like we were crazy. I mean, we are, but crazy for Bloodies! Anywho, not a bad drink but definitely on the pricey end and a letdown after we had made a pilgrimage there specifically for the yellow drink. Again, very pricey, but this place offers way more fixin’s than other establishments outside of the midwest, so we kind of get it… but honestly, you should provide what is promised on the menu. I also think our bartender was in a rush… again, didn’t ask us our choice of liqour and the fixin’s were a little lacking. Not sure we would ever dine here again and definitely wouldn’t pony up for this drink. 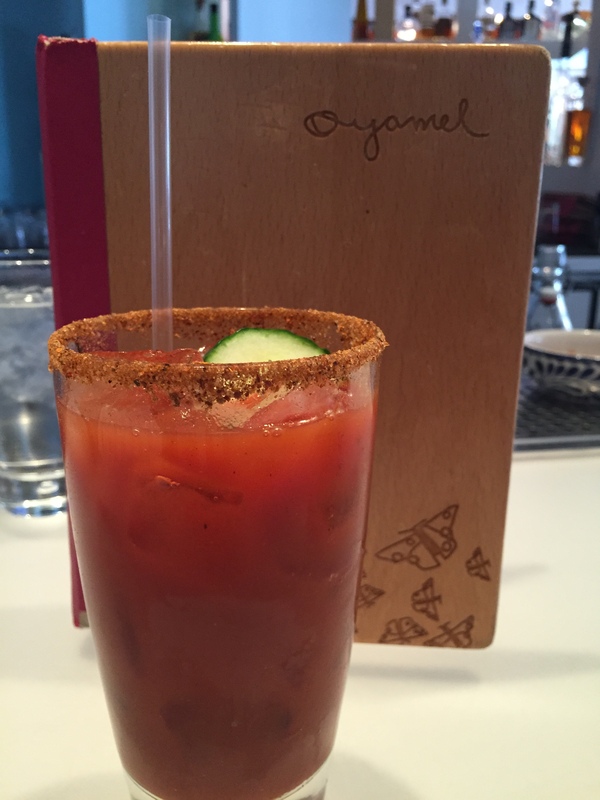 Oyamel showed up on two sources that I generally trust when it comes to food and beverage: Anthony Bourdain’s D.C. list and Thrillist’s List of Best Bloody Marys in D.C. When I happened to walk right by this restaurant, I thought it was a sign. I sat at the bar and asked the bartender if they had their famous bloody marys. “Yeah, we make a good one,” she replied. I have no idea if this bloody was rimmed with the “sal de gusano,” or not and the bartender just used vodka without asking if I had a preference, so I didn’t get to try that famous mezcal. It also was not garnished with cilantro and marigold. Overall, this bloody mary was decent and I guess it was my fault for not inquiring further or specifying, but had I known, I would have probably tried the sangria or margarita to go with my food, which for the record, was fantastic. The made-to-order guacamole was heavenly and melted right into the still-warm fresh-baked tortilla chips. I must admit I devoured way too much and could barely eat my meal, which was also top-notch. Definitely a cool place to check out, but maybe skip the bloody to make more room for guac. 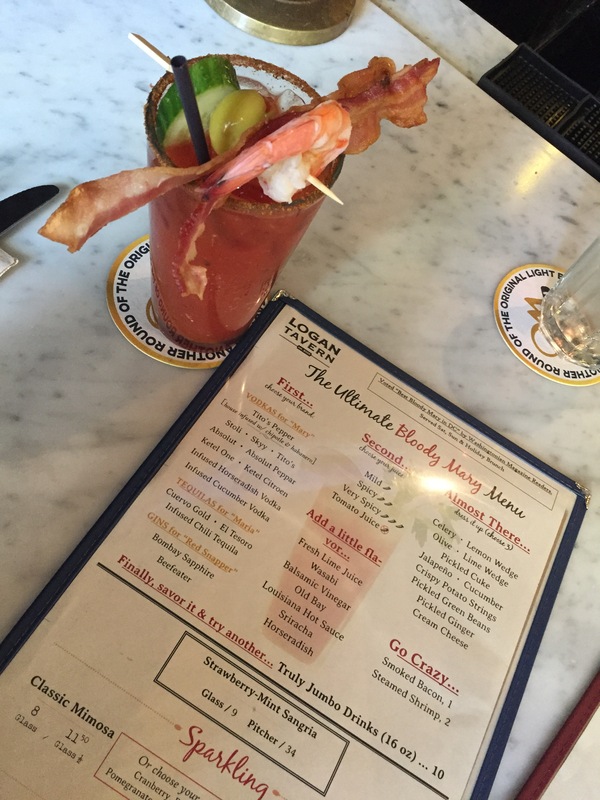 When researching Bloody Marys in Washington, D.C., we came across several sites that recommended Logan Tavern. 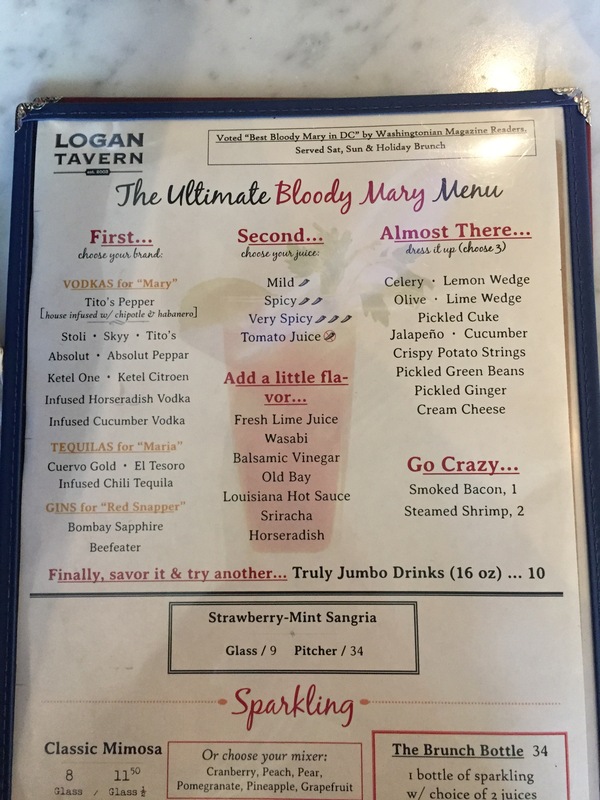 The reason Logan Tavern’s Bloody Mary was voted “Best Bloody Mary in DC” by Washingtonian Magazine readers is because of their Ultimate Bloody Mary Menu, which is served on Saturdays, Sundays and Holiday Brunch. Mix: Housemade. We chose infused cucumber vodka with horseradish, on the spicy side. With a menu like this, if you don’t like your drink, quite frankly, the only person you have to blame is yourself. However, we were quite pleased with the Bloody we had made, considering ourselves somewhat experts in the field. The difference between Logan Tavern and a Build-Your-Own-Bar, is that you choose options from the various categories and then they construct it for you. It’s the lazy-man’s build your own bloody and it’s better because there is a little bit of restraint built in (no I don’t really need 5 pieces of bacon in my glass…). Definitely the best Bloody Mary we had in DC and we highly recommend you check it out! Tell us about your own creations in the comments below. On a recent trip to Washington, D.C., we stopped at the historic Old Ebbitt Grill. Founded in 1856, this is known as Washington’s oldest saloon, frequented by many a president, such as McKinley, Grant, Johnson, Cleveland, Theodore Roosevelt and Harding. 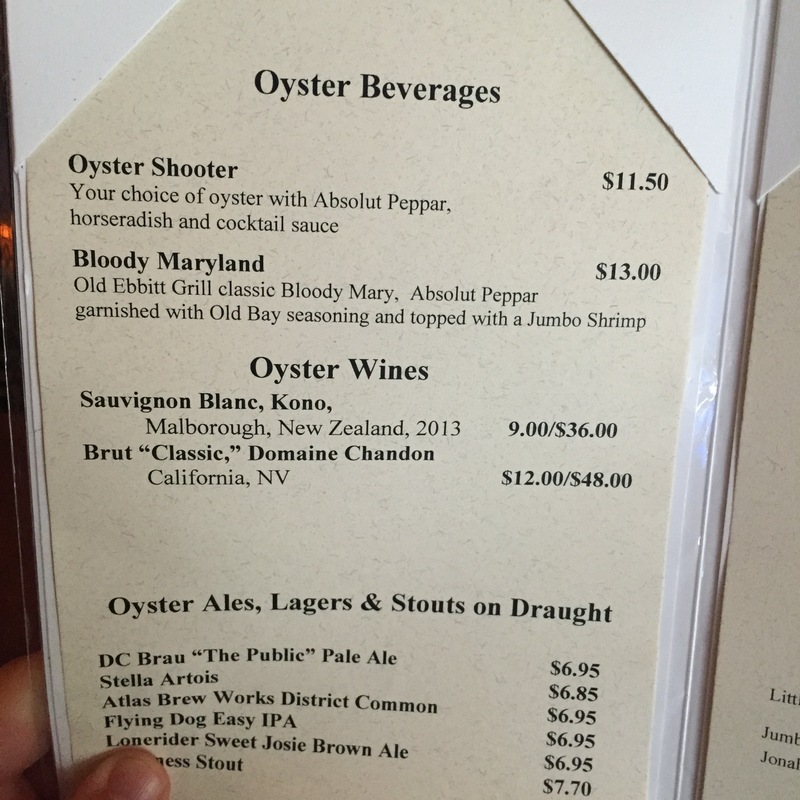 The restaurant is also famous for its raw bar, so you have to order the Bloody Maryland. 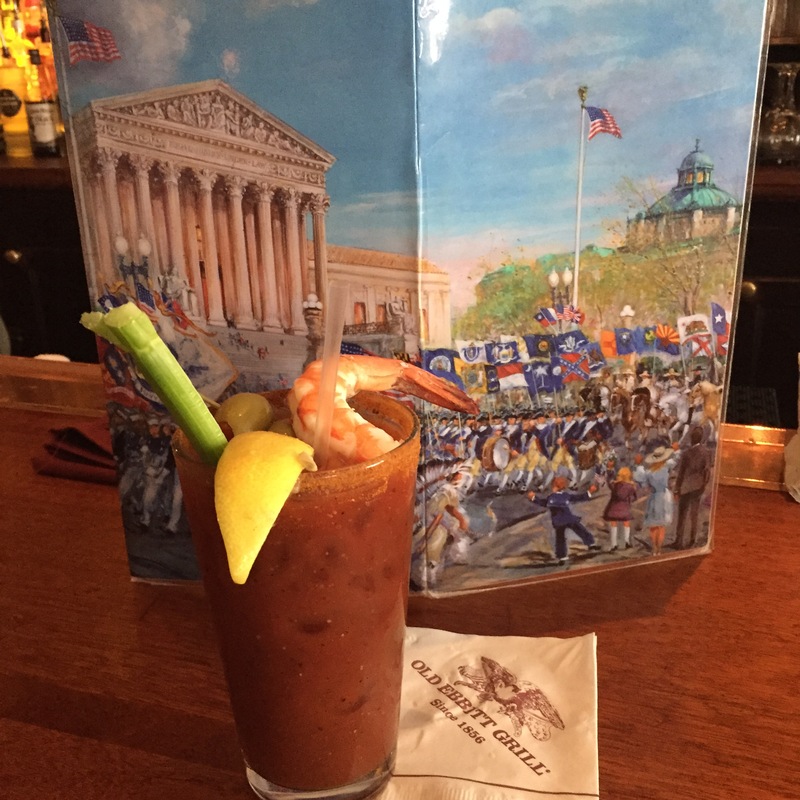 We started talking to our bartender at Old Ebbitt Grill and, once he realized we were from the Midwest, he told us that the Bloody Marys there were good; however, we might be disappointed if we were expecting your typical Midwest feast in a glass. We told him we were experienced travelers and knew that all Bloodies were not created equal. Still, “You’re not getting one of those beer backs here,” he reiterated. And that was just fine with us because our Bloody Maryland stood on its own. It was very flavorful, with hints of horseradish, lemon and Old Bay… and it made the perfect beverage with which to wash down the oysters we ordered at happy hour. This is definitely a DC tradition, so you’ll want to add this to your list when visiting the nation’s capital.